Blanka Design came up with the ‘Re-Bag Project”. Several different designs, making only 250 of each design as special edition project. Meaning I have to remember to take extra special care of mine. After ordering I had to wait almost 3 months to receive it – mainly because it was a pre order – but once I got it… It doesn’t leave my side. My own Mary Poppins bag. They are very well made and even have a cute wee pocket on the inside, perfect for your mobile or whathaveyou. RE-BAG 5 TO 11 OCTOBER 2007, SEA GALLERY, 70 ST JOHN STREET, LONDON EC1M 4DT. 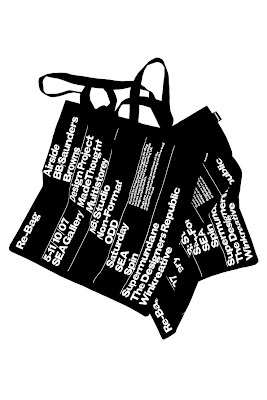 CURATED BY PROGRESS PACKAGING, RE-BAG IS AN EXHIBITION OF LIMITED EDITION REUSABLE CANVAS BAGS DESIGNED BY 15 LEADING UK DESIGN PRACTITIONERS. 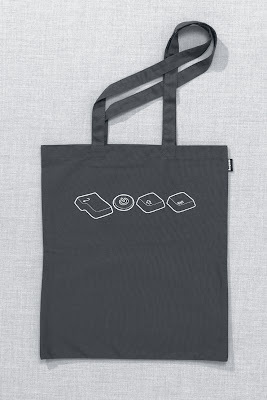 DESIGNERS RESPONDED TO A BRIEF TO CREATE AN IMAGE FOR A BAG ON THE THEME OF SUSTAINABILITY AND REUSABILITY. THE RESULTING BAGS NOT ONLY PROMOTE THIS IDEA BUT ARE ALSO IN THEMSELVES AN ECOLOGICALLY FRIENDLY ALTERNATIVE TO THE USE OF NON-GREEN MATERIALS IN EVERYDAY PACKAGING.